Shawanda R. Randolph retired from the United States Air Force after 20 years of service. God would use her keen sense of wisdom, insight, and innate leadership skills, to help guide, direct, and influence those around her, especially those in leadership and potential leadership positions. It was her discipline, worth ethic, and problem-solving skills that led both superiors and fellow associates to depend on her counsel. As, a result, many flourished under her advisement and mentorship. Even then, she understood that it was God who gave her the courage and desire to watch others walk their God-given paths in and outside of the military. Once Shawanda received this revelation, she understood what would be an essential concept to her ministry: Identity. She knew that once people discovered who they were in God, they would be more effective leaders. She learned that people often separated their professional, personal and spiritual lives. However, as God used her life as a model, He showed her that the three were inter-connected. He used everything he called her to be to propel her into the ministry full-time. Shawanda holds an MBA in Health Care Administration from Wilmington University and a Master’s in Theology from Fuller Theological Seminary. She also holds A.A.S degrees in Healthcare Administration and Human Resources. She is the proud mother of one very special son. At “Fresh Manna” she offers prayers, wisdom, and prophetic instruction on some of the most pressing issues in society today. Fresh Manna’s mission is to not only to nourish the soul of the lost, and replenish those who have accepted Jesus into their hearts but build the next generation of God’s leaders. She has published Fresh Manna: Journey To A New Beginning. Fresh Manna is a devotional that is comprised of practical life lessons and questions that will challenge your way of thinking, encouraging you to begin to view yourself and the world through the eyes of The Creator. It currently available on shawandarandolph.com, Amazon, Barnes & Noble, Books-A-Million and other online retailers. 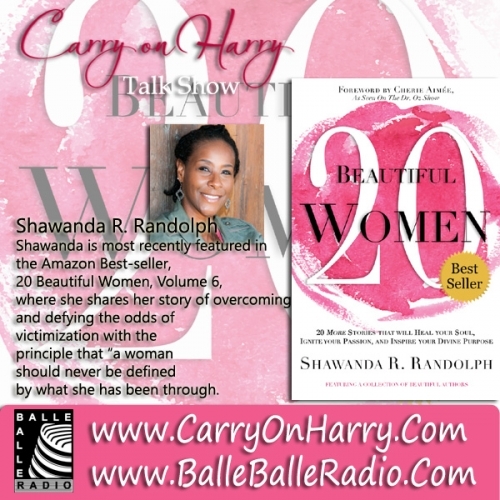 Shawanda is most recently featured in the Amazon Best-seller, 20 Beautiful Women, Volume 6, where she shares her story of overcoming and defying the odds of victimization with the principle that “a woman should never be defined by what she has been through. Instead, the challenges we overcome, make us stronger and our stories are meant to encourage and empower others, giving them fuel for the future.” Shawanda resides in Arizona with her son and has started a nonprofit, DeeCilla Comfort Center, with plans to open a center for those victimized by human trafficking, domestic violence, and sexual assault.